COMING AROUND - Gene Giles laughs at a stop along the garage bus route offered by Parking and Transit Services. 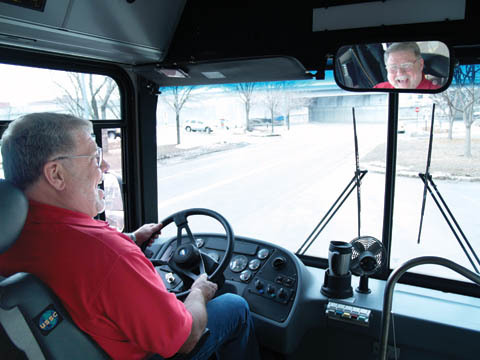 A retired Lincoln Police Department patrolman, Giles has driven UNL shuttle busses for four years. Photo by Troy Fedderson/University Coummunications. One of U - This is a series featuring employees of UNL. Stories are open to anything interesting, from on-campus jobs to at-home hobbies. When Maren Vik's father was deployed in Iraq for a year she didn't really know any kids with a parent in the military. UNL psychology professor Will Spaulding has dedicated his career to improving the quality of life for Nebraskans living with chronic severe mental illness. In a career spanning nearly three decades, he has developed a cutting edge treatment program that is now utilized globally. Sherwin B. Nuland, clinical professor of surgery at Yale School of Medicine and fellow of Yale's Institution for Social and Policy Studies, will give this year's final E.N. Thompson Forum lecture at UNL. He will speak at 7 p.m. March 22 at the Lied Center for Performing Arts on "Faith, Philosophy and Medicine: Reflections on Maimonides." The event is free and open to the public. David Burge, host of UNL's Real Nebraska, finished as runner-up in the NBC "Today" show's Anchor for Today contest. The bow-tie wearing associate director of admissions attended a conference in Washington, D.C. earlier this week, but discussed his NBC experience with University Communications' Sara Pipher. When you think of the Great Depression, you think of hard times, scarce jobs, families struggling, the Dust Bowl... and lively swing music. "The Journey Home: Native American Art Show" is on exhibition through March 26 at UNL's Great Plains Art Museum. The exhibition "Art and Architecture" opens March 19 at the Eloise Kruger Gallery in Architecture Hall-West. Susan Marks, the International Quilt Study Center's 2007 visiting scholar, will present the lecture "Patchwork and Quilting in the United Kingdom Before the American Influence," at 9 a.m. March 19 in the Home Economics Building, room 31. One of Sheldon Memorial Art Gallery's early 20th-century icons, "Room in New York" by Edward Hopper, will be removed from the museum's permanent collection galleries in mid-March in preparation for a major tour. The winter issue of UNL's Great Plains Quarterly (issued March 1), contains articles about contemporary Plains artists, the 1876 Canadian Treaty Six with Saskatchewan Crees, and a historiography of Mari Sandoz and her book, "Crazy Horse: The Strange Man of the Oglalas." A retrospective of contemporary German cinema, "Berliner Schule," plays at the Mary Riepma Ross Media Arts Center from March 23 to April 5. Lincoln-based musicians Paddywhack will perform a free concert at 6 p.m. March 15 on the Lied Center for Performing Arts' main stage. Mannheim Steamroller presents "Fresh Aire: The Music of Mannheim Steamroller," at 7:30 p.m. March 10 at the Lied Center for Performing Arts. "The Lives of Others," winner of the Academy Award for Best Foreign Language Picture, and "Commune" plays the Mary Riepma Ross Media Arts Center from March 16 to April 12. Those big cherry flavored wax lips that my friends and I used to buy when I was a boy, well, how could I resist this poem by Cynthia Rylant of Oregon?